Time to put on your LBD? 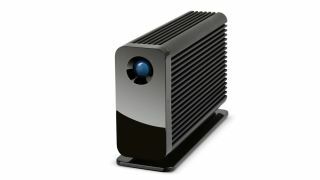 Lacie has announced that its Little Big Disk Thunderbolt 2 is the fastest portable storage around - offering up speeds of 1375Mb/s. The storage specialist has, as the name suggests, integrated Thunderbolt 2 into its latest offering, which will be available in the next few months. As you would expect from Lacie, the drive's design has been a big consideration and the company worked with design bigwig Neil Poulton to give it what it describes as a 'cutting edge' design. Thunderbolt 2 is faster than USB 3.0 and the speed of data transfer allows for the drive to be used for things like streaming 4K and 3D pictures. That inevitably leads to Lacie's Little Big Disk Thunderbolt 2 being described as ideal for video professionals. Although we don't yet know the final price, Little Big Disk has a set of 500GB SSDs in RAID 0 at its heart and, as a result, don't expect this to be on the cheaper side of things.